1. The Drawing: This was one of the hardest sketches I have done. I wanted to work in my 5.5 X 8.5 daily journal, but feel as if I really needed a huge piece of paper to draw all of the moldings and details. Thus this is simplified for the smaller format. The apartment walls and trim are off-white and the floors hardwood. The furniture is all slightly different shades of brown wood and the quilt that I made is cream background with a red and green feathered star with mutliple red and green pieced borders. Newbies like me should get a laugh when they notice that the furthest wall sconce "just appeared" in the middle of my quilt! If you look really quickly you don't notice it. The rug is a complicated red/green/beige geometric design - do I have enough inner strength to tackle the design? I wanted to post this before I added watercolor because I have no idea how I will develop the sense of deep space and warm light. Any ideas? 2. My feelings as I enter my apartment: I love my apartment and my life in New York City. My childhood home is 22 miles from our apartment, in Northern NJ - our move to Manhattan was like coming home. Although we live on a busy avenue, it is possible for me to get completely lost in my apartment, or to be surrounded by people from all over the world within minutes. We can walk almost anywhere that we want or take easily available public transportation. Our car is used only when we are leaving the city - I drive 11 miles to work and back. The entry hall has an antique table (purchased when we lived in San Antonio Texas) and an antique Victorian oak hall tree (purchased when we lived in San Diego). It is covered with hats, caps, and earmuffs which I ignored in my sketch, but just this minute realized that I should have then added the empty hooks! 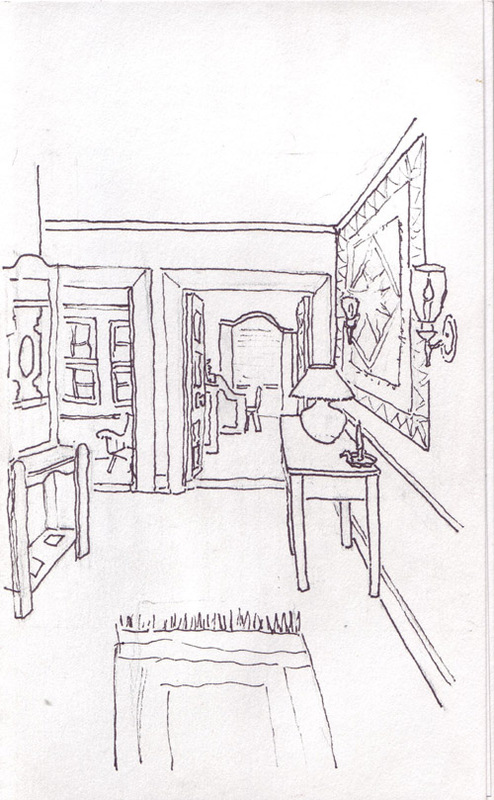 The double doorway on the right leads to the living room and the door to the left leads to the dining room. The light on the table is hand blown glass, and on most of the time, creating warm light and shadows. The antique brass candle holder was purchased during a favorite vacation in Amsterdam. We just renovated one of the bedrooms and now have a beautiful mahogany library - my new favorite room. Maybe I'll be brave enough in another week to sketch in there. EDM Callenge #49: Draw my refrigerator. Given the choice of drawing the outside or the inside, I decided to take a comfy seat instead of standing in a really small space. 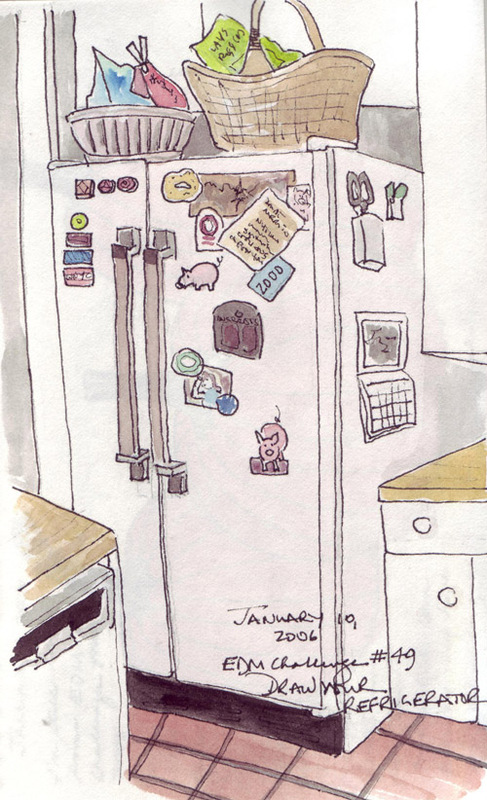 We obviously have too many kitchen magnets - very few of them are holding anything up. The three pig magnets have magical power to allow my husband and I to remain thin. I think that I'll throw the rest of them away. The baskets on top hold our bags of chips - very tempting. 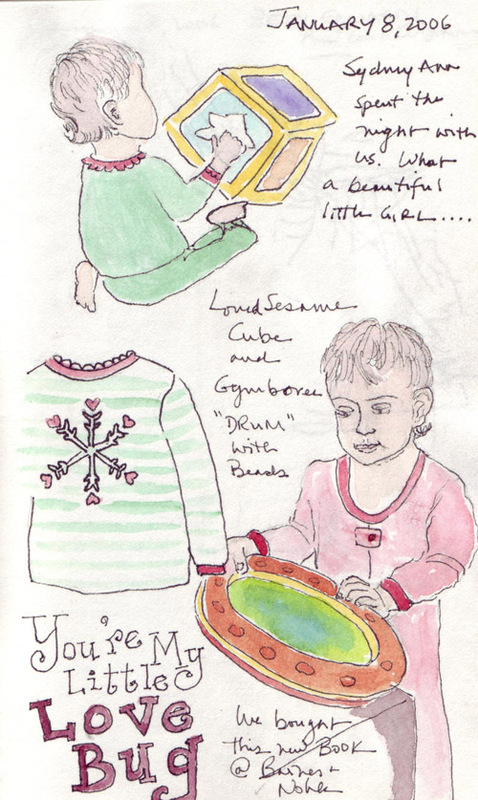 Our 12 month-old granddaughter spent the night last weekend and I managed to get several quick sketches of her playing. I have enormous difficulty drawing faces - and even though it doesn't look very much like her, it is an improvement over prior attempts which will remain unpublished. 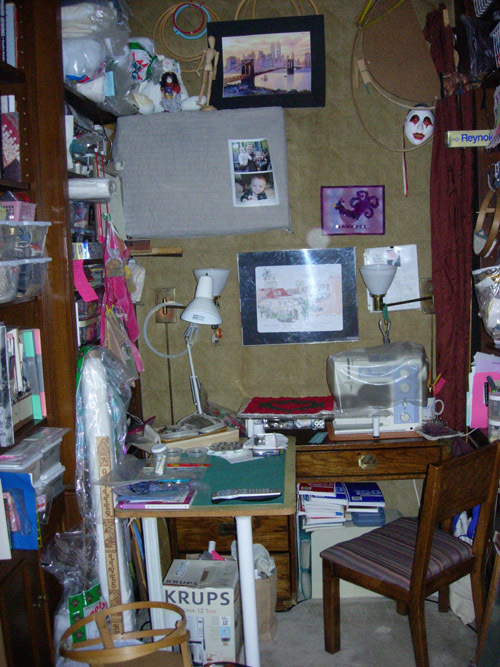 My Fabric Studio: This is the old maid's room in my 1920s New York City apartment. The previous owner made this 7 ft 3 inch by 9 foot 9 inch room into a small library and the lovely cabinets/bookshelves that line both side walls are just visible. It would be hard to catalog all of the fabric, thread, and supplies that fill this small room - there is one ceiling to floor cabinet that is just filled with procion dyes and all of the supplies necessary to paint/dye silk. 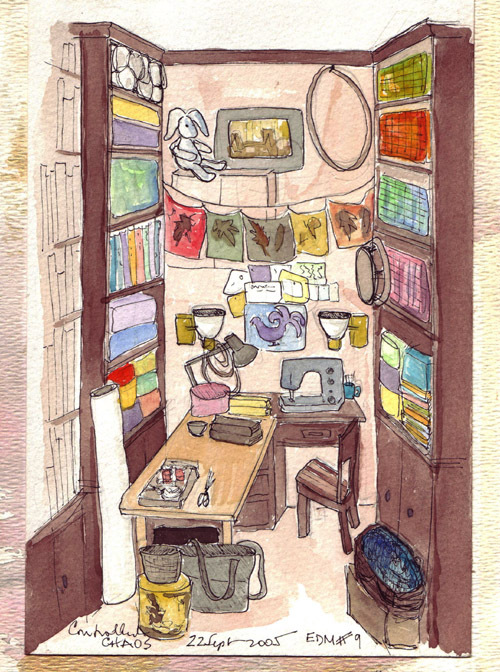 This is a quick sketch of my fabric studio. I love this space and can lose myself for hours in the midst of all of this fabric and these supplies. 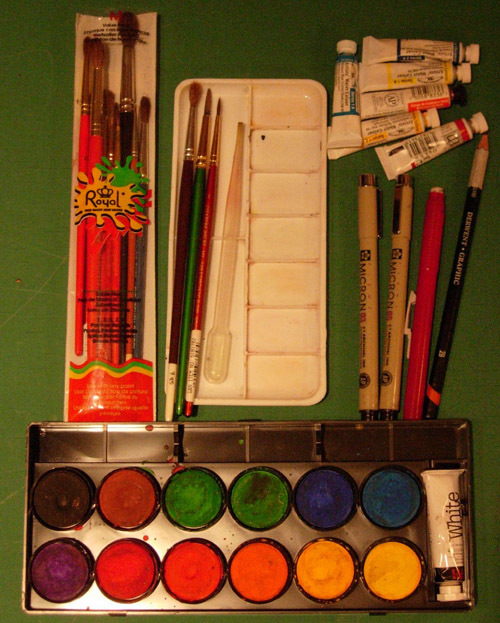 My rudimentary art supplies: French School student grade pan watercolor paints, several 5 ml Winsor Newton primary color tube watercolor paints, assorted brushes, a plastic palette, Pigma micron pens (03 and 05), a Derwent graphic 2B pencil, and a Bic click eraser. I don't have room to expand so I'll have to continue to work in small format journal sketchbooks! For approximately 30 years I have selected and made a prototype ornament each Fall and then made 20-24 of the same ornament for gifts for Family and Friends. Each of these is made entirely of fabric, usually scraps from my many quilting projects. 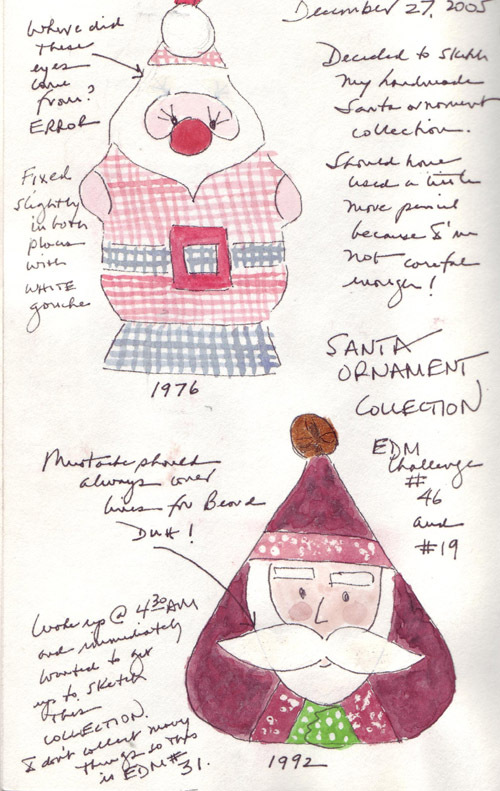 I couldn't think of any specific thing that I collect for EDM Callenge #19 until I started to decorate our Christmas tree this year. Although I have a small collection of reindeer, angels, and birds, the Santas are my favorite. Each of my children have a full set of these ornaments for their Christmas trees. It was fun to paint the fabric designs. 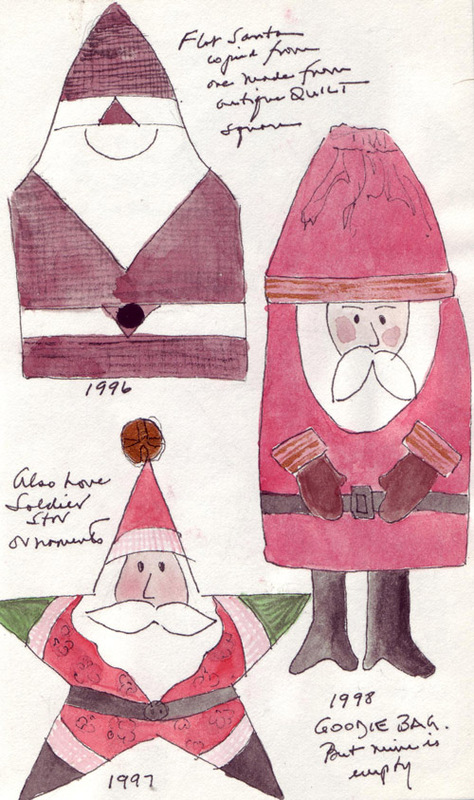 The top 2 Santas are flat. The star Santa is heavily stuffed.